According to the Environmental Working Group (EWG) more than 10,000 Americans will die each year as a result of asbestos exposure. Throughout North Carolina’s rich economic history, asbestos was used as a key component for developing commerce and industry. From the time it was introduced as a multi-purpose fire retardant, to the time it was understood to be hazardous, residents and workers were exposed to toxic asbestos fibers by the hundreds each day. The heaviest exposure rates were recorded between 1920 through the late 1980’s. An exposure of as little as 1-3 months would produce life threatening health problems, including Mesothelioma and Asbestosis, which would manifest 10-50 years later, essentially creating a time lapse that would place victims in a delayed state of borrowed time until their symptoms would begin to show. In its asbestos hay day, North Carolina received and processed more than 10,000 tons of asbestos shipments, which in turn landed North Carolina the rank of the 13th state with the highest instances of Malignant Mesothelioma. The highest asbestos exposures came from North Carolina shipyards, factories, mines, power plants, industrial plants, iron mills, steel mills, oil refineries, and construction sites that produced residential and commercial buildings. The use of asbestos in North Carolina construction of residential and commercial buildings lead to the exposure of teachers, children and many non-construction related personnel. Others were exposed without their knowledge through the use of products containing asbestos that were mislabeled or from products that came from a manufacturer that was unaware of the damage their products were inflicting. Workers were not only exposed without their knowledge or consent, but many workers unknowingly exposed their families to second hand asbestos exposure upon returning home from a job site with contaminated clothing. Naturally occurring asbestos sites have been found in many North Carolina counties. Natural asbestos deposits have been found in or near the counties of: Ashe, Avery, Caldwell, Jackson, Macon, Mitchell, Transylvania, Yancey, Boncombe, Haywood, Madison, Watauga, Clay, Henderson, Mecklenburg, Forsyth, New Hanover, Rowan, Wake and Polk. Other sites that have been linked to asbestos exposure in the past were Mines located in North Carolina, and vermiculite processing plants. Southern Vermiculite Plant, High Point Refinery, Carolina Wholesale and American Vermiculite Company, were responsible for processing tons of asbestos that led to thousands of asbestos exposures. Military bases were also known to have dangerous levels of asbestos. Bases like: Fort Bragg, Camp Lejuene, Camp Grainger and areas near Tarrawa Terrace, have all had reports of exposure to asbestos containing products. Military personnel may have been unknowingly exposed to asbestos from shingles, paints, drywall and floor tiles during cleaning exercises. Currently, North Carolina Air Force facilities boast that all base housing units were built with asbestos-free materials, but these buildings are relatively new and such claims do not reflect previous buildings that were built using asbestos containing materials. Asbestos companies chose profits over people. They willingly withheld information that could have prevented thousands of deaths. In North Carolina, there have been over 1,410 asbestos related deaths and counting due to asbestos exposure. Mecklenburg County alone has had more than 100 asbestos-related deaths, 57 being from Mesothelioma. Those who have been exposed to asbestos and developed asbestos related diseases should contact a North Carolina Mesothelioma Lawyer to get compensation for their pain and suffering. If you have lost a loved one to asbestos related cancer, you may also be entitled to compensation. The statute of limitations to file an asbestos-related claim in North Carolina is 2 years from the date of a wrongful death and 3 years from the initial diagnosis of Mesothelioma. If a claim is not filed within the set time limit, then the case may become “time-barred”, which means that the case has expired or “evaporated’. It is important to note that North Carolina does not file class action lawsuits for asbestos claims. This is because each case is unique and each victim has a different history of asbestos exposure. Asbestos-related claims filed by workers in North Carolina fall into the category of workers compensation. If a worker has died as a result from asbestos related disease, then surviving family members may be eligible to receive compensation by filing for workers compensation on behalf of the deceased. Employment must have been at least 30 days with a period of 7 consecutive months, or 210 days. Employment was 5 days a week for 6 straight weeks. Employment lasted 2 days a week for 15 weeks. Employment lasted 1 day a week for 30 weeks in a row. North Carolina has determined that specified time frames of asbestos exposure were long enough to result in life threatening injury. $2.7 Million dollars was awarded to a 61 year-old North Carolina Insulator who developed Mesothelioma after years of working with Asbestos. $1.1 Million dollars was awarded to a 66 year-old Building Contractor that developed Mesothelioma. The victim developed Malignant Mesothelioma after working with asbestos in North Carolina. $2.6 Million dollars went to a 72 year-old North Carolina Shipyard worker who developed Mesothelioma after being exposed to asbestos. $2.5 Million dollars was awarded to a North Carolina Plumber who was exposed to asbestos and developed Mesothelioma. A $4.2 Million dollar verdict was ruled by a North Carolina court on behalf of a 41 year-old Construction Worker who developed Mesothelioma after working with dangerous levels of Asbestos. $1.1 Million dollars was awarded to a Navy Veteran who developed Mesothelioma at the age of 71, decades after an asbestos exposure. We help Mesothelioma patients and their families make educated decisions about how to start with filing asbestos and Mesothelioma claims. We will also recommend an experienced North Carolina Mesothelioma Lawyer or North Carolina Mesothelioma Doctor to help you get your claim started. 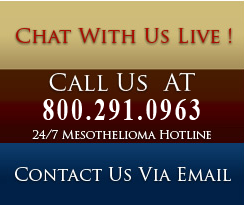 We have a Mesothelioma Hotline - Toll Free: 800.291.0963 that is available 24/7 to talk with a live Mesothelioma Help Center counselor. We understand that those dealing with asbestos cancers face a number of challenges, including the tremendous costs of Mesothelioma treatment. We have helped many families get experienced legal and medical help for their Mesothelioma cancer and asbestos cancer cases. We will actually walk you through the process of contacting an experienced North Carolina Mesothelioma lawyer that we have worked with to get you the best possible settlement for your North Carolina Mesothelioma claim. Deciding which North Carolina Mesothelioma law firm to represent you and your case is very important. Choosing the right lawyer will also be important to your North Carolina Mesothelioma settlement. Many Mesothelioma and asbestos cancer cases in North Carolina have settled with multi-million dollar verdicts. Mesothelioma cases are not restricted to just one state. Filings are usually in multiple states. Mesothelioma cases are contingency based cases. This means that no money should be paid by you. Mesothelioma lawyers earn their money only if they win you case. You are entitled to an experienced North Carolina Mesothelioma lawyer that has a track record of success in North Carolina asbestos lawsuits. Experience - The Mesothelioma Help Center has been helping North Carolina Mesothelioma victims and their families for more than 12 years. It has been well documented for many years that asbestos exposure can result in the development of deadly cancers, particularly Mesothelioma. Mesothelioma has a latency period of 20 to 50 years after the first exposure to asbestos. It is estimated that there will be about 250,000 cases of Mesothelioma before 2020. There are currently about 3000 new cases of Mesothelioma diagnosed per year, mostly in men over the age of 40. About 4,000 People die each year from Mesothelioma. During the 20th century, some 30 million tons of asbestos were used in industrial sites, homes, schools, shipyards and commercial buildings in the U. S.
More than 700,000 people have filed claims against more than 6,000 Asbestos companies. The number of Mesothelioma and asbestos related victims is projected to increase steadily over the next 10 years. One out of every 125 American men who die over the age of 50 will die from an asbestos related cancer. Asbestos companies knew of the dangers of asbestos exposure in North Carolina for many years before ever warning the public of those risks. It is thought that around eight million people in the United States have been exposed to asbestos over the past half a century, and many more asbestos related cancer cases are expected to be reported in the next 25 years. We will walk you the process of getting connected with a North Carolina Mesothelioma Lawyer. Copyright © 2004-2019. MESOTHELIOMAHELPCENTER.ORG. All Rights Reserved.